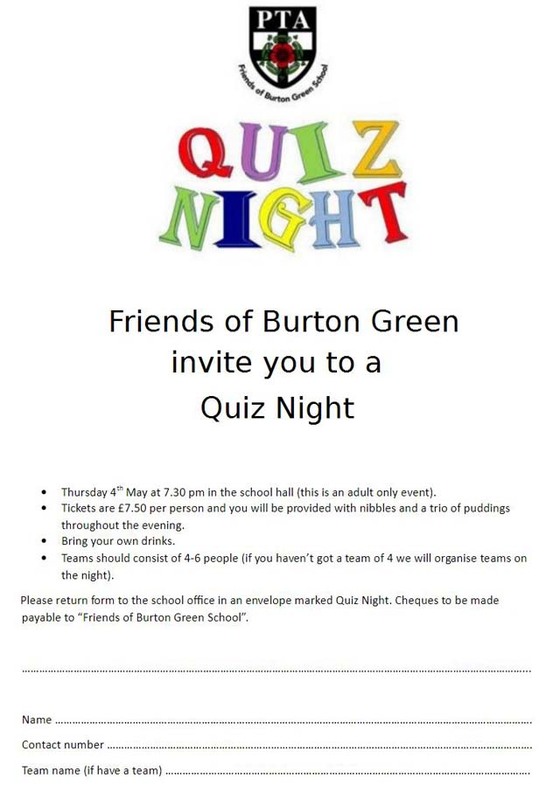 This Quiz event organised by The Friends of Burton Green School is open to the whole community and promises to be good fun. It's hosted at the school this year. You will be happy to know that your performance in the quiz will not be marked and used to inform your parents about your current performance! We hope to see you on the 4th May. Don't forget to send back the form below with your team details/payment. 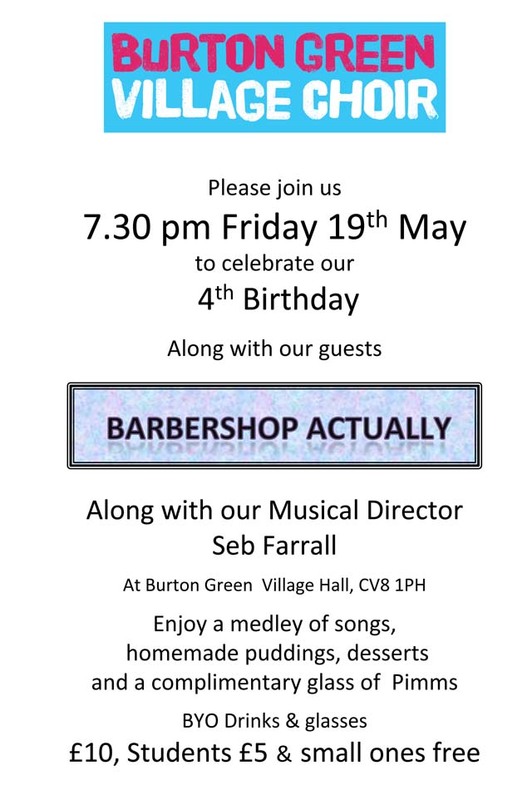 Burton Green Village Choir would like to invite you to our 4th Birthday Concert with a selection of home made puddings/ deserts and a complementary glass of Pimms! Please bring your own additional drink and glasses. We are delighted to have "Barbershop Actually" joining us. The Coventry Sprint Triathlon 2017 will be taking place on the morning of Sunday 21st of May, passing through Burton Green. The event consists of a 400 metre swim, 20 kilometre cycle ride, and 5 kilometre run, starting and finishing at the Excel Centre in Mitchel Avenue, The event is expected to begin at around 9am. Competitors are expected to start at approximately 1 minute intervals. The entire course takes approximately 1 hour to complete. The cycle route will start in Mitchell Avenue, turn left into Charter Avenue and then left again onto Cromwell Lane. For the first loop it then goes back down Westwood Heath Road, Westwood Heath Way and back to the Excel Centre in Mitchell Avenue. For the second loop it continues along Cromwell Lane before turning left onto Red Lane and then the Birmingham Road. It then goes up Beehive Hill in Kenilworth before coming back down Crackley Lane / Bockendon Road and turns right onto Westwood Heath Road once again, finishing at the Excel Centre. 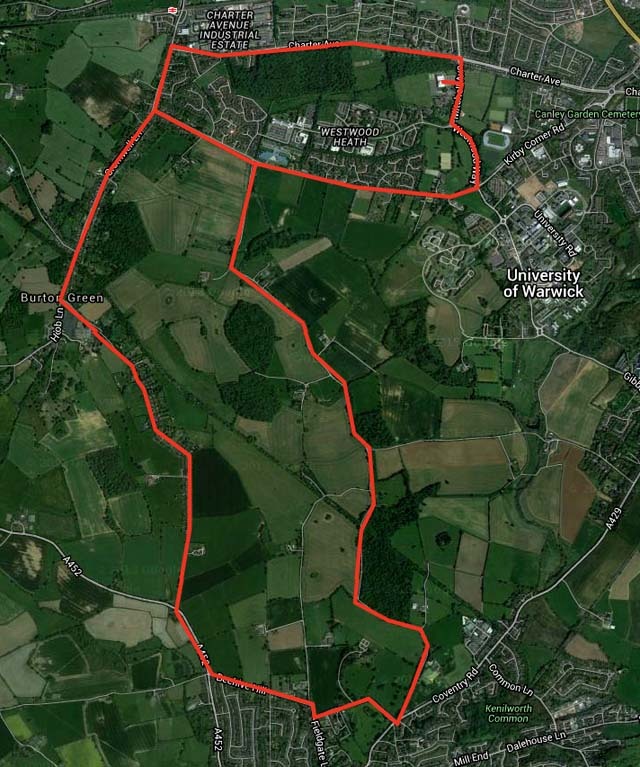 The first smaller loop is 5 km, and the second larger loop is 15 km, making 20 km. 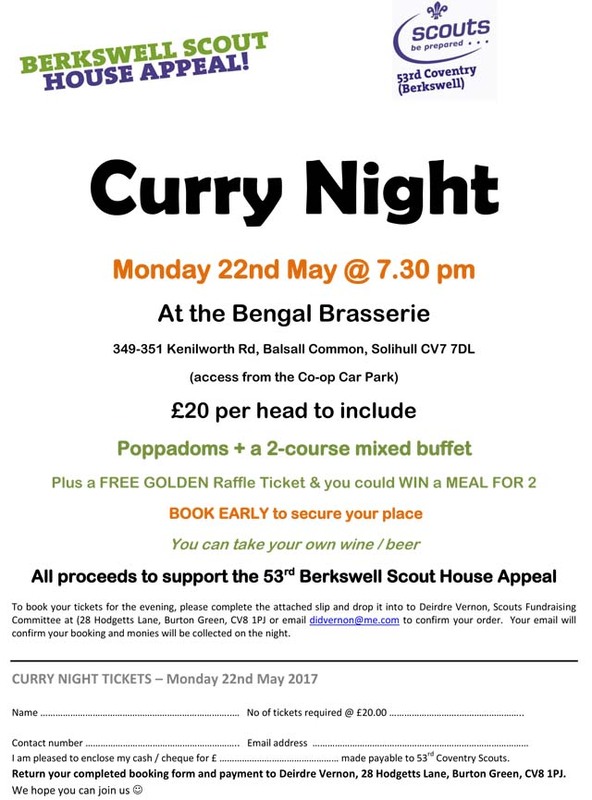 Following the successful event which the Berkswell scouts fund raising team ran back in November last year. We are doing another one on 22nd May. Please note you are able to bring your own wine / beer too! You may have read in The Bugle that this year an Open Garden event will take place in Burton Green. This is not connected to the National Garden scheme but is just a few people opening their gardens in aid of village hall funds. This is a reminder to put the date in your calendar. There will be approx. 12 gardens open throughout the village. Plants will be on sale so please pot up any surplus plants you have and we will collect these just before the event. We will also hold a book sale with a theme of Garden, Cookery and anything remotely relating to the Countryside! We will collect these closer to the event but if you have any need to donate now, we can arrange collection. Further details about the event will be advertised closer to the day. Residents groups from Burton Green, Duggins Lane and Westwood are collaborating to organise a May Day Walk. There will be two alternative walks. Both walks will commence at 11am. This walk will commence at Duggins Lane. Lady Godiva will be present at the start. At the Berkswell Reading Rooms, there will be a ploughmans and cakes, and an optional call at The Bear. This walk will commence from the old Peeping Tom (now Hickorys) and walk to Nailcote via the public footpath over the fields. Hickorys doesn't open till 11-30 so there should be car parking space. You can also use the Hedgerows Nursery site for parking. We walk 100 yards down Cromwell Lane and turn left, following the signed public footpath. We go onto the field through gates, following the signed path, and head to the corner entrance to Nailcote Hotel. The footpath is firm but decent footwear required. It is an easy walk, a leisurely 20 minutes.The Coventry Morris Dancers will perform at Burton Green, after the return, between 1.30pm and 2.00pm. It is intended that both groups of walkers should meet at Nailcote. Coffee and a cookie will be available at the Nailcote Hotel Bistro for a for £2. There will also be a bouncy castle. Residents may travel to Nailcote or Berkswell by car if they prefer.